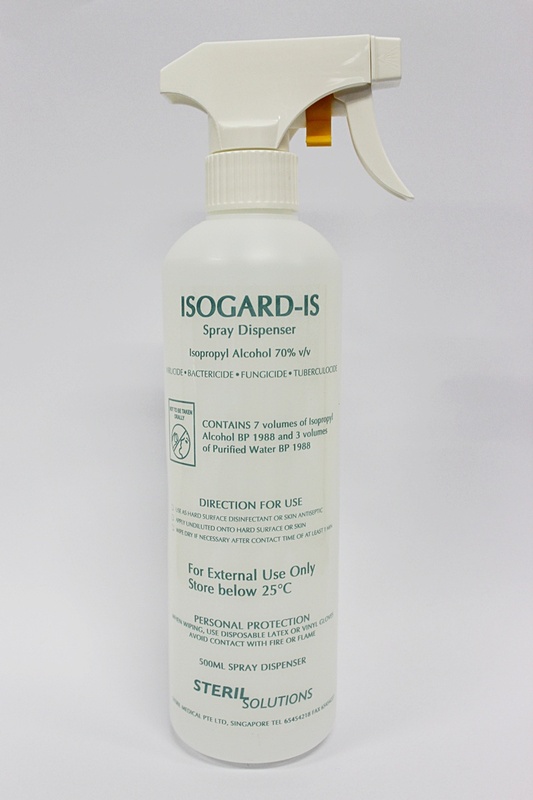 ISOGARD contains 70% ethyl alcohol by volume. It has excellent bactericidal activity against most gram-positive and gram-negative organisms and good activity against the tubercle bacillus, fungi and viruses, including cytomegalovirus and HIV. ISOGARD is supplied in a hand spray dispenser bottle that allows the disinfectant to be evenly applied on hard surfaces that required disinfection. The disinfecting action is rapid and effective except against spores. ISOGARD is not a high-level disinfectant and is not to be used for intended sterilization of hospital instruments. It is recommended for disinfecting the hard surfaces of OR operating tables and procedure trolleys to decontaminate them and prevent cross-infection. It can also be used for disinfecting PVC connectors in tubing circuits, stethoscopes and other small surfaces. SKU: HUN 10 40 04. Category: STERIL Solutions.